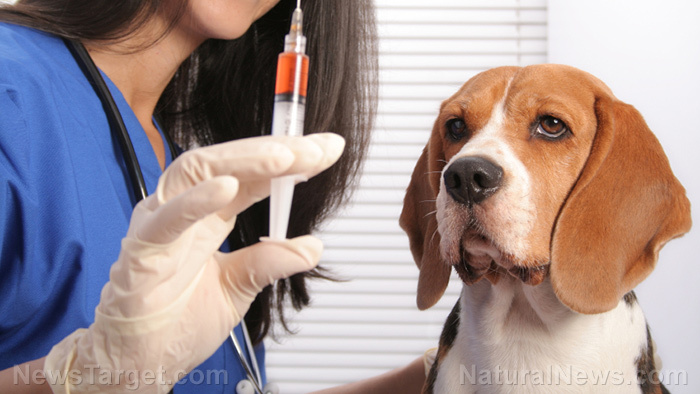 (Natural News) Could it be that most of your pet’s health problems are due to vaccines? Let’s examine the consequences of over-vaccinating your pet, and the pragmatics of this type of healthcare as it affects the pet and your bank account in ways you never imagined possible. Little did you know that pet vaccines create more problems than they solve. Every single vaccine can potentially start the clock for debilitating chronic diseases, allergies and disorders for your pet. Though most veterinarians will tell you that adverse reactions to vaccines by your pet are much less likely than with humans, that’s simply not true. It’s not uncommon for pets to experience severe health reactions shortly after being vaccinated, and these can continue onward for weeks, months, and even years, including oral ulcers, lethargy, hair loss, immunosuppression, behavioral changes, respiratory disease, facial edema, weight loss, sarcomas, anaphylaxis, autoimmune hemolytic anemia, arthritis, and yes, abortion. Then there’s the cost of these torturous, experimental and unsafe vaccinations. Did you know that tigers in the wild live twice as long as domestic cats, and wolves in the wild live twice as long as domestic dogs. It’s not “genetic” and it’s not because the owners get tired of their reliable companions. It’s also not due to infectious disease outbreaks, so let’s take a close look at what’s REALLY causing all the chronic health damage and the shortened lifespan of our beloved pets. Did you know there are no adjustments in vaccine dosage for the size or age of your pet? The same goes for humans. A 300-pound man receives the same dose of mercury (ethylmercury) in a flu shot that a 6-month young, 16 pound baby gets. A 200-pound Great Dane gets the same dose of aluminum and formaldehyde as an 8-pound Shi Tzu. Your 9-pound housecat or 2-pound kitten gets the same dose of neurotoxins that a 420-pound lion receives. Talk about overwhelming the animal’s immune system! Today, vaccine reactions are at an all-time high. In fact, a U.K. study of 2,000 dogs and cats revealed a shocking 10 percent risk of adverse reactions from vaccines, contradicting the manufacturers report rate. (They lied profusely and said it was 0.015 percent.) Surprise, surprise. Plus, small breeds of pets are 10 times more likely to experience adverse reactions to vaccines, so that means every vaccine for those animals is a health risk. It gets worse. Currently, there is NO scientific evidence that yearly jabs are needed. There’s even a vaccine for “feline leukemia” that veterinarians claim helps boost the pet’s immune system. You can’t make this stuff up. If that’s the case, then what’s in the vaccine that helps prevent cancer, and why don’t they have this for humans? It’s a complete farce – that’s why. Of course, Merck manufactures the “Nobivac” feline leukemia vaccine and claims it acts as an “aid in the prevention of lymphoid tumors…” Sure it does, and don’t forget to get the vaccine that keeps your pet pig from flying away. Meanwhile, overloading pets with unnecessary and unproven vaccines is leading to severe allergies, seizures, anemia and cancer, but no veterinarians discuss this with you or add it to the flyers stuffed in your mailbox regularly. Here’s a quick inside look at the cost of vaccines for the vet and for you. Rabies vaccines costs the vet less than one dollar, but costs you about $40 plus the “exam” given at the visit. The global vet vaccine market has crossed the threshold of $5 billion a year and continues to rise, and the U.S. is leading the charge (15 percent of most pet clinics’ income is from vaccines). It’s expected to reach $7 billion by the year 2020. Coincidentally, sarcomas (a deadly type of cancerous tumor) are on the rise in cats. Could it be due to toxic vaccines and cheap pet food (toxic meats) imported from China? Did you know that 65 percent of most clinics’ income comes from treating pets from vaccine-induced diseases? Not only do pet vaccines contain deadly ingredients, but some ingredients are not even listed on the inserts. Instead, the rabies virus vaccines lists “proprietary” and “trade secret” while reassuring you the components not listed are “not hazardous.” Well then why not disclose them? Is it some original recipe like KFC that must be protected from the competition? So when the dog or cat goes into anaphylactic shock or breaks out with severe allergies, we don’t even know if it’s directly due to the “proprietary” blend of top secret ingredients? Is that why peanut oil is not listed in childhood vaccines, even though there are trace amounts? Most pet vaccines contain organ tissue from other animals, including cell tissue derived from monkeys, rabbits, cows, sheep and pigs. Plus, injecting mercury and aluminum is never safe for any animal! The Canine Distemper vaccine also hides ingredients under the labels “proprietary” and “trade secret.” What’s lurking in those toxic jabs that they don’t want us to know? Doesn’t informed consent include knowing what the doctor and nurses and vets are injecting into the muscle tissue of our babies and our pets? Vaccination cannot be equated with immunization because harmful ingredients interfere with normal immune system reactions, causing damage. Watch this video and learn the TRUTH about the dangers of pet vaccines! Cannabis is not the addictive, violence-driving drug the feds would have everyone believe. Cannabis is now being discovered as a cure for chronic health issues in humans and pets. Cannabidiol (CBD) is actually much safer than prescription medications that are chemical based. CBD compounds are being administered to pets as medicinal marijuana treats to end fits of depression, lethargy, and pain, and in short amounts of time. Some pets on the verge of being euthanized by their owners are now fully functional and happy again. Yes, plant-based medicine is re-emerging because true biological healing comes from plants, not these dangerous synthetic concoctions where they can’t even tell you the full list of ingredients.